#spon: I’m required to disclose a relationship between our site and Oral-B. Oral-B may have provided us with content, product, access or other forms of payment. All opinions are my own. As I write this my son is with my husband at a Smokies baseball game. Spending “guy” time together. Spending guy time together is a common occurrence. In fact, they went zip lining and exploring a cave yesterday. My husband is a phenomenal father. The kind of dad that any child would hope for… a hands-on dad. I am incredibly proud of him. He is a fantastic partner, so supportive and helpful to me. And my son simply ADORES him, I don’t blame him… I do too. Oral B is celebrating the ‘power of dad’. Dads do have an enormous amount of power. I’m blessed that my husband (and my step-dad) have always used their power for good. Since dads have had the uncanny ability to make kids smile for generations, Oral B wants you to give Dad another reason to smile. 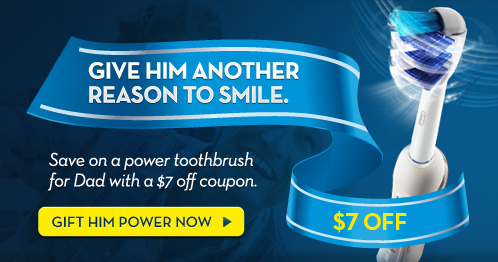 Sons and daughters can keep dad smiling with a healthy smile by giving him the gift of an Oral B power toothbrush. Oral B is also donating $25,000 to the March of Dimes to honor of dads. I knew there was more reasons I loved Oral B than just the beautiful and healthy smiles they help maintain. Check out the sweet video of the power of dad’s smile. And this Mashable Article: Oral-B Celebrates Father’s Day With Touching YouTube Moments. 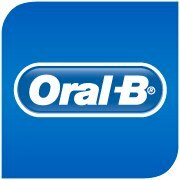 Be sure to Like Oral-B on Facebook and Follow Oral-B on Twitter . This Father’s Day I will be proudly celebrating the #PowerofDad with my husband and my Dad. Oh, I have some good news… Oral B wants to give one of Blog by Donna readers an Oral-B Deep Sweep TRIACTION™ 1000 power toothbrush. Open to US residents 18+ and older. Just enter on the Rafflecopter form below. Good luck! My most vivid memory is the time when I was first learning to do math and was having the hardest time grasping subtraction. He helped me until I fully understood and could do it…he’s the best dad. My favorite memory was spending time alone with my dad. I have 7 brothers and sisters and he would make sure that he would spend one on one time with each of us as much as possible. So that time was so special to me. my dad always came to my sporting events, never missed a single one! My memory of my dad is him taking us to the lake putting us on a float and taking us out as far as he could go! My favorite memory of my father is him walking me down the aisle at my wedding. As A Single Dad, My Dad Did Everything For Me! In Middle School I Had A Musical That Required A Poodle Skirt As The Costume. My Dad Went To The Fabric Store Ad Stayed Up Several Nights To Hand Sew A Skirt For Me. It May Have Not Have Been Perfect But I Know It Was Made Straight From The Heart! the first time i went to the zoo – got to see so many animals that I loved, and he made sure i had a great time!! My dad passed away last year of cancer but I remember during the winter he would love to ski and i remember just riding on the lift and just enjoying each others company and talking about the simple yet important things in life! I cherish those memories now! Recently, I was struggling in an area in my life and I gave up after months of trying but my dad never gave up. He kept trying, persevering and knocking doors for me even when I gave up hope and made a way for me! All through God’s grace! I learned the meaning of perseverance from him. That’s his #power! My power of dad moment was when my mother and father reunited and got back together after having been divorced over 25 years. I bought him a birthday cake and his eyes lit up. He said it was the first birthday cake that anyone had ever bought him. It felt good to have him back in my life and show him how much he meant to me. Thanks. I actually remember every night when my dad tucked us in how great his breath smelled, not sure why. I guess because he was gone so much and we always looked forward to him tucking us in and reading to us. There’s so much special memories, but I’m thinking of when they were going to give my dog away, and they announced me they were gonna keep it instead. I was sooo happy, and hugged my mom for convincing my dad. My dad worked during the day, and I would get such horrible sunburns I had to stay inside while my sibling went swimming. So, dad would take me at night. So much fun! Over 40 years ago and I still remember him pulling me through the water, laughing, splashing each other.